Sen. Heather Steans, a Democrat from Chicago, debates legislation on May 10, 2017. Medical marijuana products at the HCI Alternatives shop in Springfield. The Illinois Sheriffs Association is strongly opposed to the idea of recreational marijuana. Jim Kaitschuk, the executive director, believes legalizing marijuana will increase use. 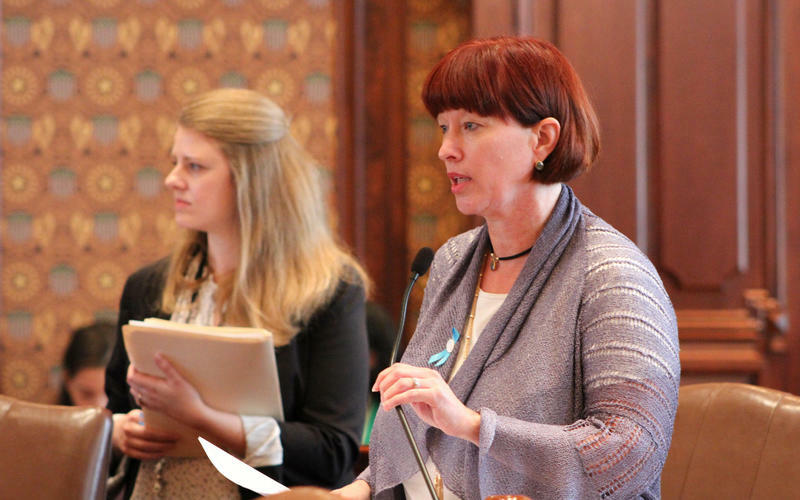 State Sen. Heather Steans and state Rep. Kelly Cassidy, both Democrats from Chicago, proposed a measure to legalize possession of up to 28 grams of cannabis for adults 21 years or older and allow facilities to sell the drug. They say the projected revenue estimates from an excise tax are between $350 million and $700 million. Clearly, not a standalone solution, but Cassidy says it's not intended to be. "Our goal is to destroy that illegal street market that makes our communities less safe," she says. "Our goal is not to bring in some massive fortune that's going to solve all the problems of the world, because it's not." Cassidy said the revenue could be put to good use. Examples include resources to combat the opioid epidemic, funding law enforcement as changes are implemented, and providing more education surrounding the risks associated with drugs, marijuana included. Substance abuse treatments and programs for impoverished areas that have been hurt by the war on drugs could also get a piece of the pie. But before lawmakers plan how to divvy up that pie, some question how big it will be. Looking at examples from other states that have recently legalized marijuana, the payoff has been slow to build. In its fourth year, taxes on legal weed in Colorado are expected to bring the state $281 million this fiscal year. Meanwhile, some law enforcement officials are concerned about the cost to regulate and enforce new rules. They also say legalization won't eliminate the illegal marijuana market or reduce the resources needed to police it, as supporters have argued. Steans and Cassidy are reworking the proposal. They say they have some Republican support, but not enough to overcome a veto from Gov. Bruce Rauner, who has said he's against the idea. "We also believe that it may be until we have a new governor after the election in any event that we call it for a vote," says Steans. Details such as how much an excise tax would be and how the legal weed market would interact with medical marijuana are still being negotiated. Steans says Illinois has been able to learn from other states, specifically when it comes to tax structures. "At some point, people much prefer to do things legally," she says. "But if you charge them so much more, they'll still go to the street corner." The total economic impact of a recreational marijuana program can be difficult to guess. Advocates for the program base their projections on national and state studies that identify current and regular users of marijuana. Political scientist Kent Redfield says the $350 million to $700 million prediction is possible, but there's a lot of uncertainty. "It's not just free money in terms of what you generate. There will be a cost with regulating it and enforcing those regulations," he says. In terms of what it means for the state budget or economy, Redfield says it's a significant amount of money, when the state needs an overwhelming amount of money. "It doesn't translate to a 10 percent cut in property taxes," says Redfield. "But, in a time of budget crisis and a time of great state debt, more revenue certainly helps." Redfield says to expect the state to generate on the lower end of that prediction, especially in the first years if a program was passed. Illinois isn't a pioneer in the creation of a recreational program. Colorado and Washington were the first two states to legalize recreational use in 2012. Oregon followed in 2014. All three are generating hundreds of millions of dollars in tax revenue, but they didn't immediately reach expectations. Washington's program was implemented through a ballot initiative. Washington's Office of Financial Management completed a Fiscal Impact Statement in 2014 projecting the program would generate up to $2 billion over the first five years. Five years into the program, the industry has more than $3 billion in sales and has generated over $700 million for the state. Oregon also passed its program through a ballot initiative and after only two years, the state has already made significant changes. Initially, it planned to tax producers, partly because Oregon doesn't have a sales tax. As the state prepared for implementation, it became clear a different system was needed, says Mazen Malik, a senior economist with the Legislative Revenue Office. More products became available, such as topical creams and edibles. So, Oregon lawmakers switched to a point-of-sale tax and allowed local governments to add another tax on top of that. With those changes, the Legislative Revenue Office estimated recreational marijuana would bring in $35 million per year. The first fiscal year, the marijuana tax brought in $20.6 million, according to the Department of Revenue. In the second fiscal year, it brought in nearly twice that. Malik says they only believed the recreational program would draw in one third of the illegal market users, when it actually captured about two thirds. 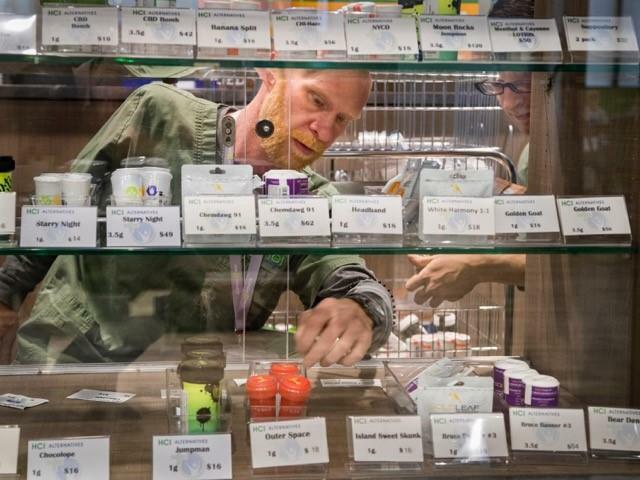 Prices have dropped as well, from about $11 to $12 per gram of marijuana to roughly $2. Colorado's program started off much slower than expected. Initial predictions in 2014 estimated $135 million in local and state taxes for the first year. The actual came in around $88 million. Chris Stiffler of the Colorado Fiscal Institute says policymakers didn't anticipate as many people staying in the medical program, but many did because taxes were much higher on the recreational side. "There (were) a lot of people doing the math, and if they were using more than about an ounce, an ounce and a half of marijuana a year, it was cheaper for them to pay their doctors visit to get their (medical marijuana) card and then buy their marijuana at much cheaper rates," he says. Recreational weed is still taxed higher than medicinal. There were three points of taxation, a 15 percent excise tax, a special state sales tax and a 2.9 percent sales tax. Colorado lawmakers changed the rules this year, getting rid of the regular sales tax on retail marijuana and upping the special sales tax. Despite a rocky start, the program is expected to generate $281 million this fiscal year. Steans says there would be a reasonable excise tax, but also mentioned she'd like to allow local governments to add their own sales tax on products, within reason. She's advocating for a cap on the local sales tax, as Oregon does, to ensure the prices stay low enough to eliminate the illegal marijuana market. 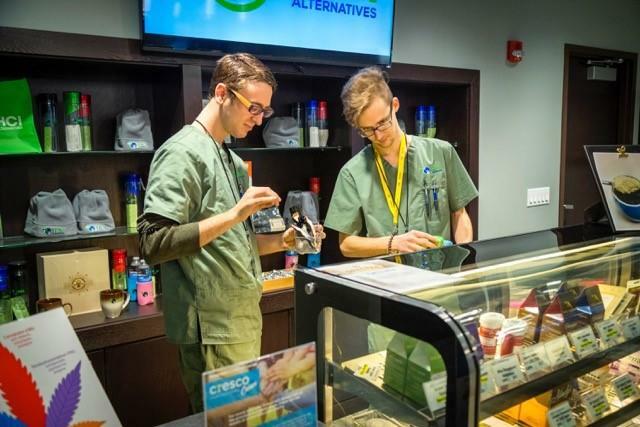 Christ Stone, the CEO of HCI Alternatives, a medical dispensary in Springfield and the Metro East, says he believes there will still be value in both programs and has been an active voice in advocating for recreational use. He plans to expand his business to recreational if it's approved. "Depending on the way the bill is structured, we would keep both," he says. "If there's not a substantial value on the medical side, if they craft it in a way that makes it so that you can be an adult user and not hardly pay any tax on it, the medical program probably dies." The medical program also got off to a slow start, Stone says. Illinois first passed the Medical Cannabis Pilot Program in 2013, but it wasn't until 2015 that dispensaries were able to sell it. Initial projections estimated there would be 100,000 medical patients in the program at the end of the second year. There were fewer than 30,000. Stone says the lack of support from Rauner's administration, individuals incorrectly filling out their applications and the unwillingness of many doctors to certify patient use hurt the program. Because of these issues, he has concerns with a recreational system but he hopes to sell medicinal and recreational. "Working with the current medical industry to craft a recreational bill that is thoughtful, that maximizes the benefits of the state and patients, as well as the adult users is going to be necessary to make sure that it works right," says Stone. Still, the Illinois Sheriff's Association is strongly opposed to the idea of recreational marijuana. Jim Kaitschuk, the executive director, says a majority of law enforcement calls already deal with drugs or alcohol. He says he believes legalizing marijuana will increase use and won't eliminate the black market. "While it may make some money for the state, at the end, our concern is that the cost of the community is going to be significantly more than the revenue that's generated," he says. The Illinois Sheriff's Association is strongly opposed to the idea of recreational marijuana. 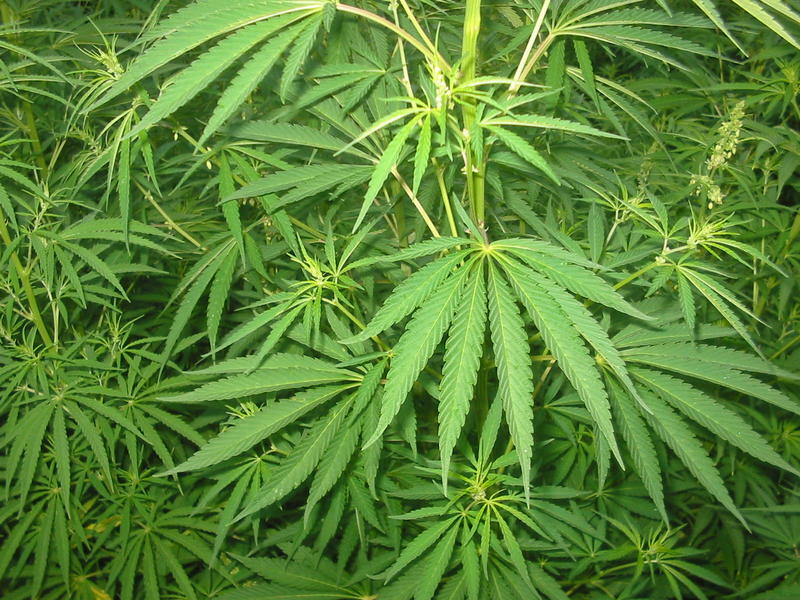 Jim Kaitschuk, the executive director, believes legalizing marijuana will increase use. The most recent Gallup poll shows that 45 percent of Americans say they have tried marijuana, while 12 percent say they currently use it. 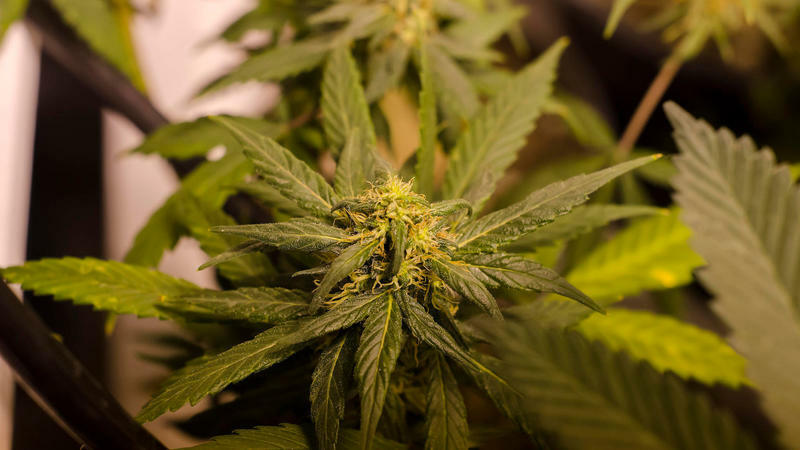 In Illinois, a recent poll from the Paul Simon Institute showed that 66 percent of voters strongly supported the legalization of recreational marijuana if it is taxed and regulated like alcohol. But Kaitschuk argues that just because people are already doing it, doesn't make it right. "Heroin is out there. Do we want to make it legal? Cocaine is available. Do we want to make it legal?" Regardless of moral beliefs, Kaitschuk says, enforcement is the primary concern, specifically traffic accidents and driving under the influence. Since there is no breath test for marijuana, DUIs are a major concern. There is a saliva swab test in its early stages that could be the chosen roadside method for testing. The Carol Stream Police Department in the Chicago suburbs is currently rolling out a trial program with these kits, but they don't come cheap. According to the department, each individual swab kit that collects the fluid is $30. However, a larger machine is needed to actually test the saliva. Those machines, which can also test blood and urine, cost around $4,000. The department also noted that the test cannot be used as evidence in civil or criminal court yet because the technology has not been approved. Steans and Cassidy both agree that some of the revenue should go toward enforcement and local police departments. But Kaitschuk says even with the promise of additional funds, he still has serious reservations. 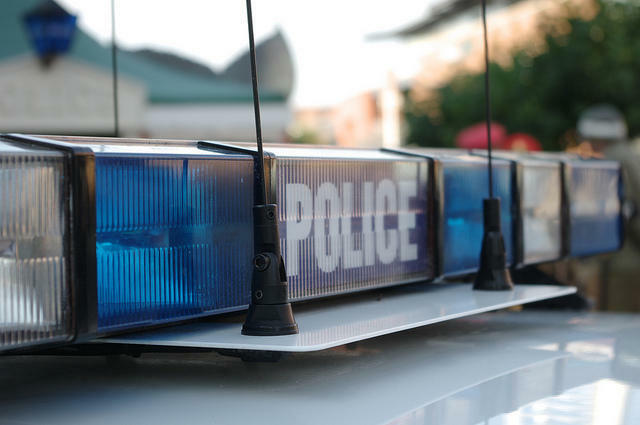 "We'd need to employ more officers and we'd need to send more people to trainings so that they could get specialized in looking for the key indicators that would show signs of impairment, and we're already depleted today." Voters in Cook County will have a chance to weigh in on the issue through a ballot question in the March primary. The rest of Illinois could answer a question on whether the state should legalize recreational marijuana on the November ballot, if the legislature approves the referendum during the spring session. 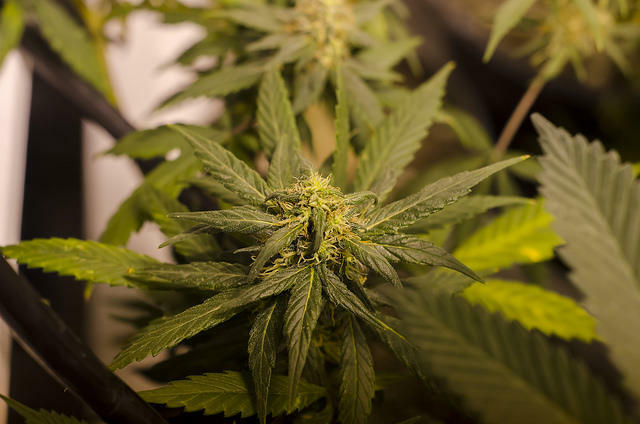 Some lawmakers say legalizing recreational marijuana should be on the horizon for Illinois. But they admit there are still details to work out. On Tuesday, voters in Ohio considered whether to legalize both medical and recreational marijuana use. It would have created a new provision in the state's constitution that allowed only ten farms to grow the plant legally. That plan had its critics, and the measure failed. Many experts have their eye on Ohio - as it serves as an example of Midwestern residents trying to take on the legalization issue that has swept Colorado and the West Coast. Kids who use medical marijuana for a qualifying condition might be allowed to use the drug on school grounds under a Illinois proposal. The legislation would allow parents to give cannabis medication to those kids if and when they need it. A cannabis dispensary is using a new tactic nearly a year into Illinois' slow-rollout of a medical marijuana program. The advertising campaign is designed to encourage doctors and patients to view cannabis as an alternative to opioids. More than 10,000 Illinois residents are certified to use marijuana for medical purposes; Kyla Travis, a Springfield resident who has multiple sclerosis, is one of them. "I'm almost 60 years old. I was diagnosed when I was 17. So for these many years, they had me on opiates," she says. Republican Governor Bruce Rauner is open to decriminalizing marijuana. Rauner has a goal of reforming the criminal justice system. One way to do that, advocates say: issuing civil penalties for low-level drug charges. 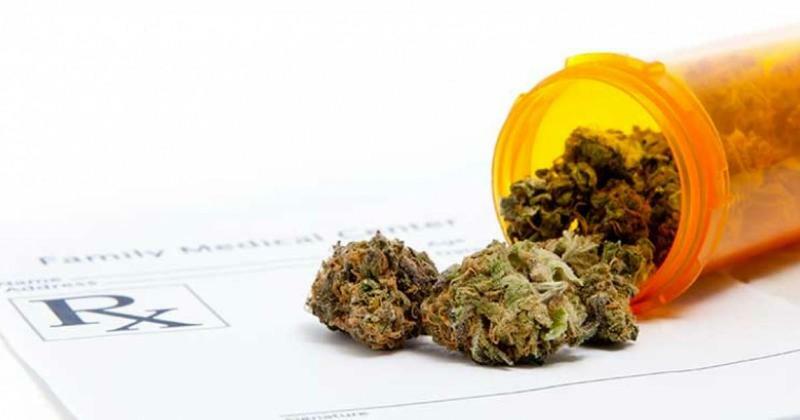 Illinois is already well into its medical marijuana pilot program, and the list of conditions it can prescribed for is being debated, as some wish to add ailments like IBS and migraines. Meanwhile, the governor recently signed a measure that decriminalizes the possession of up to 10 grams of marijuana or less.